The long run is the cornerstone of any ultrarunner’s training regimen, but what else can we incorporate to ready ourselves for a race? Secondary quality workouts can come in a dizzying array of paces, efforts, and/or lengths. Tweaking these workout parameters produces distinct physiological and psychological challenges. Race-specific workouts, or the training that reproduces the stresses we’ll encounter during our event, are best. Take terrain into careful consideration when determining which workouts to integrate. Here’s a collection of suggested workouts you can perform in preparation for your next race, depending on how flat or mountainous the course may be. Many road and track events like Mad City, Jed Smith, Comrades Marathon, and Across The Years fall into this ‘flat’ category. Popular trail events like Javelina Jundred, Umstead, Rocky Raccoon, JFK, American River, Ice Age, and Bandera also fall into this category. These races are runnable. Though there may be some climbs and technical footing, the majority of these courses have relatively flat to gently rolling terrain. Why: Use this workout to dial in smooth race-day pacing. Without hilly terrain to force us to slow down, many runners can unknowingly run these races too hard too early. Develop and practice a pacing strategy that charts an even progression through the entire race. Flat races are notorious for stressing a single set of muscles. Incorporating goal-pace workouts will enable you to endure the repetitive nature of this type of race. As the length of this workout grows, it should replace your long run. Utilizing a ‘B’ event to practice goal race pace is also acceptable. However, it is vital that you run at goal race pace, no faster. Run on surfaces most similar to your race course. Practice even pacing and race-day fueling. As the distance of your goal race increases so will the volume of the workout. Recovery is essential. Be well-rested for this workout so that race-day pace comes effortlessly. Why: This stamina-based workout is run much faster than goal race pace. By including these workouts in your training you’ll improve your lactate threshold, the most important determinant for endurance-athlete success. Tempo runs enable the athlete to shift lactate threshold toward faster speeds and harder efforts, which will translate to quicker and more comfortable race-day efforts. How: Because this training is more intense than goal-pace workouts, it lasts between 15 and 40 minutes and is performed at lactate threshold. For most, this is achieved at nearly 12k to half-marathon race pace. Heart rates should fall between 85% and 90% of maximum. Perform this workout every two to three weeks on smooth surfaces and flat to gently rolling terrain. For an easier alternative, divide the workout into a few repeats with short one- to two-minute recovery walk/jogs between. Way Too Cool, Chuckanut, Tamalpa Headlands, Squamish 50 Mile, The North Face Endurance Challenge 50-Mile Championships, White River, Miwok, Waldo, Western States, Leadville Trail, Vermont, Massanutten Mountain Trails, Zane Grey, Quad Rock, and Pine to Palm. These races have numerous climbs and descents. Under optimal conditions, a middle-of-the-pack runner will run more of the course than they will hike. Technical footing and/or high altitude may or may not be involved. Why: Long sustained mountain runs advance lactate-threshold training and build uphill as well as downhill leg strength. Like the tempo runs done for ‘flat’ ultras above, uphill/downhill mountain workouts incorporate race-specific terrain to encourage the same results. How: Find a trail or road that ascends for several miles and ideally gains between 200 and 800 feet per mile depending on the typical grades you’ll encounter in your event. Try to match the event’s predominant surface type. Complete a total of 20 to 30 minutes (early in the training cycle) to up to 90 minutes to two hours (in the advanced stages of training) of uphill running. This workout may replace the long run as its length increases. Begin the climb at goal race pace but as you reach halfway steadily increase your intensity to roughly marathon effort and then to half-marathon effort by the top. End the workout by descending the course you just climbed at an honest, but controlled pace. If no local paths fit this description, duplicate the climb on a treadmill or run repeats on a shorter hill. Why: Shorter hill workouts develop the ability to handle lactic-acid build-up, strengthen the legs, improve powerful turnover, but avoid the punishing pounding of what an equivalent flatter-paced workout would produce—allowing you to train uninterrupted through the ensuing necessary and challenging long runs. How: Find a hill with a medium slope (6% to 10%) that takes between 45 and 90 seconds to ascend. Run up at an effort equivalent to your 5k race pace. Focus on good form with powerful push off and strong arm swing. Slowly jog down the hill to recover. Start with four to six repeats and build up to 12 to 14 reps. Spread out the hill training stimulus by alternating the weeks you perform a short hill workout and the longer mountain run. The Barkley Marathons, Manitou’s Revenge, Speedgoat, The RUT Mountain Runs, Georgia Death Race, Tushars, HURT 100, Hardrock Hundred, Wasatch Front, and UTMB. These races have numerous steep, sustained, and/or technical ascents and descents. Many climbs require hands-on-knees hiking and/or trekking poles. The middle-of-the-pack runner will hike as much or more than they run of the course. Why: Race specificity is most important for these ‘colossal’ events. The majority of the population lives far from ideal training grounds, making this kind of terrain difficult to incorporate into a long run. Hiking up and down very steep and awkward slopes, no matter their length, instills confidence and builds strength. Additionally, athletes can use this time to develop trekking pole proficiency. How: Seek out a steep 15 to 45% slope. Do your best to match your event’s predominant surface. Start by accumulating a total 30 to 45 minutes of uphill and downhill hiking on the slope. Work up to 90 minutes to two hours as your fitness increases. If your slope isn’t long enough for a single pass, do repeats. Use a stair-stepper or treadmill if you have no slopes available. Wear the gear you’ll use on race day. Perform the workout often, especially if you aren’t getting this specificity during your long runs. Metabolic pathways that help us store and use fuel sources more efficiently. Biomechanical advantages that reinforce proper running form and range of motion. Recruitment and growth of fast-twitch muscle fiber. Oxygen uptake from the blood once it reaches the muscles. Because many ‘colossal’ races are held at high altitude, VO2 workouts help prepare the body for the efforts you’ll experience at oxygen-poor elevations. A series of one-minute fast and one-minute jog rotations. Several four- to five-minute fast repeats with four- to five-minute recovery jogs in between. Any combination of fast repeats and jog recoveries will suffice as long as the intensity falls within the parameters above. These workouts can be done on any flat to rolling surface with good footing. Keep in mind that the purpose is to run fast so avoid technical trails. There are many instances where an event’s average elevation gain may fall closely between two of the event classifications. 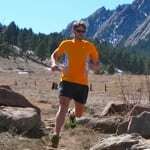 For example, Quad Rock 50 Mile, whose average gain is about 230 feet/mile, treads the line between ‘mountainous’ and ‘colossal.’ In this case, I suggest using a combination of the workouts from the two classifications during your training or choosing those workouts that will strengthen your weaknesses. I can’t reiterate enough that these secondary quality workouts are not a substitute for long runs. VO2 max work, short hills, and tempo runs alone won’t get you to the finish line; their purpose is to develop more leg strength and better turnover and improve the heart and lungs’ ability to handle higher workloads. Long runs—on the surfaces (dirt, pavement, rocks, and roots), terrain (flats, hills, and mountains), and in the conditions (heat, cold, and altitude) we’ll encounter during our event—still remain our primary workout. Don’t waste your time by practicing skills that won’t be useful on race day. Instead focus on incorporating plenty of race-specific workouts into your program. They’ll always deliver the biggest bang for your training buck. Do you do any of these or similar race-specific workouts? Can you share a few details on how you employ them into your training? Which race-specific workouts do you feel have helped you feel most prepared on race day? Nothing wrong with this advise from Ian Torrence. What I see in the ultra running community is that runners try to advance to early to the more difficult races and then they get frustrated with DNF’s. Easy to avoid if you build up your experience from shorter to longer ultras and then to more difficult ones. That might take 10 years or so but you will have a much higher success rate. The only thing I don’t agree on is the amount of long runs you need for 100 milers. For normal runners with no winning ambitions there is no need for 5-8 hour runs to finish a 100 miler. If you do a couple of build up races and the 100 miler is not in the first couple of years of your overall running you can do it with a lot shorter long runs. With a weekly mileage between 30-50 miles, long runs around 20 miles are plenty. You can do one or two longer ones but don’t put all your energy in to the long runs that only keeps you slogging along. If you choose NOT to run any “B” events in preparation for your 100-mile, then you had better make sure that you run a few 5-8 hour runs on your own to dial in nutrition, pacing, equipment and experience the specific demands of your goal race. I work with many athletes that have an average weekly volume of 30-50 mpw. However, they are all tested a few times before race day with this length of long run be it a build-up race (“B” race) or solo training run. This is all fine, but what if you live where a ‘hilly’ run is 250 feet of gain in 6 miles and the steepest hill is 10% for about 20 ft. ? Can a treadmill really prepare you for the hills you describe (that I’ve never run on)? Very nervous about some races I have on the calendar. Shorter cutoffs than I am used to and way more climbing. Just looking for reassurance, I guess. I have read articles about treadmill workouts. I suggest that you embrace the treadmill and any other “terrain” you can find, whether it be a parking garage, golf course, sand dune or stadium stairs. Consider planning a vacation where your race will be held and spend a training weekend on the course or traveling to a shorter “B” race that mimics your goal race’s terrain. Do what you can to build confidence. And most importantly, plan well and be realistic on race day. We run these races to challenge ourselves. You’re certainly doing this! Good luck with your training and racing! Any chance of a metric version of this article? Inclines are so much easier to understand when you’re talking in metres/kilometre! I’d be curious to know if there’s been much research done on the physiological effects of very long training runs. Presumably there’s a point of diminishing returns after which the risks of injury/fatigue outweigh the benefits. I was joking about the metric system, but thanks anyway. I realize over-training is a concern but I was specifically asking about the benefits of running for 6-9 hours. Does this actually provide any specific benefits over shorter runs? Maybe there’s a strengthening aspect, but perhaps that could be replaced with specific strength training. I can see how there would be psychological and logistical benefits, and maybe that’s as important. Ha! I’ll still try to incorporate the conversions in other posts to simplify things here on out. Barry, see my response to Markus above regarding the long run distances. What my brain hurts with is how you train for something like Tor Des Geants – 205 m and 24000m climbing? How much more than a 100m training programme?? Great training advice, thanks! Quick question: what are your thoughts about mixing hard downhills and easy uphills into the “short hills” workout from the mountainous section? Is there value to short fast downhill efforts? Or would those potential gains already be covered by the “long uphill/downhill mountain runs”? Do you have any thoughts about strength training for a multiday race–48hr, 72hr, or 6 days? I can’t see “run more” as a viable training strategy and am thinking that there must be something one can do to improve their chances of success at races of this length. Heavy lifting (squats, deadlifts, etc. ), running with a weighted vest, running multi-hour runs up and down a hill? Thank you for any suggestions.